My dad has been getting on me for years about taking my vitamins. Since I’m still in recovery from a recent injury, I figured this may be a good time to start. This will be my vitamin regimen for general wellness, but I’m hoping a side benefit is that this helps move my healing along. Please note: I’m not a doctor, nutritionist, RD, etc. Please don’t take this as medical advice. Be sure to consult your health care provider before making any changes to your diet and/or starting new supplements. My friend recently told me that they’re saying in California that vitamins cause cancer. I find the conflicting information out there really confusing. Many sources say they’re good. Many say they’re bad. It’s hard to know who to trust, but I think I’ll take my chances. *My dad warned me that too much vitamin D can be toxic, so I plan to get my blood tested to ensure my levels aren’t too high. Dad said the lady he spoke to at his local health food store recommended these two probiotics, which are the ones he’s taking too. Since I prefer whole-food based vitamins that are as natural as possible, I decided to get them all at Whole Foods. They have a pretty big selection, and the staff was really helpful in making suggestions on which multi-vitamin to take. While only the multi-vitamin is whole-foods-based, I appreciate the level of quality of the products offered at Whole Foods. 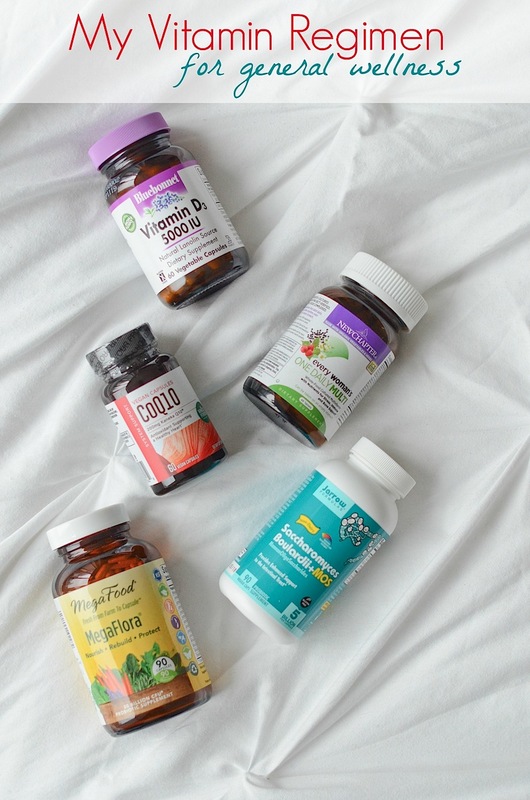 What are your must-have vitamins?